A Teutonic Monster Magnet, right down to the carbon copy Dave Wyndorf-inspired vocals and his retrogressive vision of rock as the perfect soundtrack for reading your favorite Marvel comic book, Black Space Riders are certainly derivative but, depending on your current mood, can also be just as entertaining, that is if you like This Is Spinal Tap. With influences ranging from the aforementioned Monster Magnet to Black Sabbath, Danzig, and Fu Manchu (we're not ranging too far here, are we? 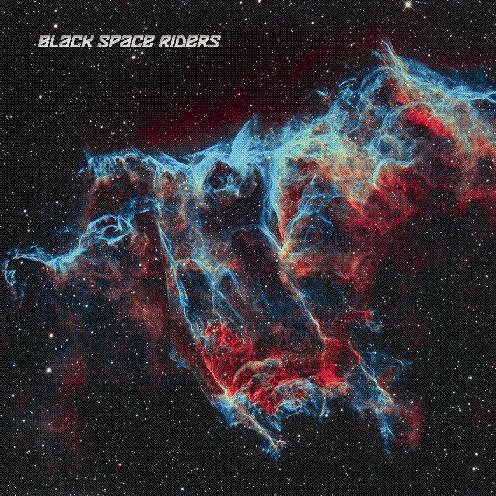 ), the debut album by Black Space Riders is like reading The Mighty Thor in Old High German to the accompaniment of Wagner as performed by Rammstein. One thing's for sure: these guys are really into space. The title of every song on the album references the word "space" in one form or another-"Spacebomb," "Stoned Bikers in Space," "Voodoo Spaceship," "Lonely Space Trucking Man," etc. After the ninth consecutive track of riffing guitar, thudding bass, crashing drums and guttural chants of "I'm your space-rockin' man," it definitely gets repetitious and even tiresome. But if you're into stonerspacedoom metal, Black Space Riders will appear unto thee as a demon god demanding your oath of fealty. And while their sound is demonstrably more metal and doom than psychedelic and space, these latter elements certainly find their way into most of the group's songs. The best tracks on the album are the doom grinding space-driven anthems for acid-eating astral bikers: "Spacebomb," with its supercharged guitars and stoned geek bravado, and "Ride on, Black Space Rider," with its bone-crushing breakneck pace, definitely challenge for lordship of the post-Sabbath overload throne. Simply put, if you like any of the other bands mentioned in this review, chances are you'll like Black Space Riders.